The last review of this week comes from one of the most eagerly awaited exhibitions of this year. Although I obviously relish the chance to go to large-scale Pre-Raphaelite blockbusters, you can't beat smaller single artist shows to help get you some insight into lesser known figures. The Watts Gallery seem to excel in this sort of thing, bringing us Eleanor Fortescue Brickdale, Richard Dadd and now Marie Spartali Stillman, over from the Delaware Art Museum where the exhibition first showed. I have to admit that when I see Marie's works, my first thought is always of Elizabeth Siddal. I wonder if, had she lived, her art would have resembled Marie's in subject and style. 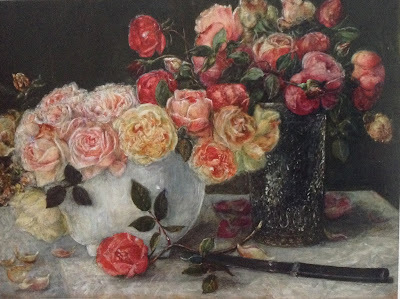 The Watts Gallery now gives us opportunity to view a collection of Marie's works together in one room, to admire her talents, not only in pretty Pre-Raphaelite subjects like A Rose in Armida's Garden but also in still life and landscape, both in intimate and grand scale. I am guessing this is a smaller show than what exhibited in Delaware as the Watts have used their lower temporary exhibition space only, rather than the two floors they usually fill, but none the less it is filled with romance and beauty. There are familiar pieces such as The Enchanted Garden of Messer Ansaldo which is even more beautiful in real life (as these things often are). The pattern on the coat of the rather Simeon Solomon-esque fellow on the right is especially noteworthy. I have to admit I'm not normally a lover of still life, but Roses with Palette Knife is so vivid you could almost smell it. It presents you with such a tightly packed space filled with colour, not unlike the exhibition itself. It hangs in a trio of Marie's fruit and flower paintings filled with vibrant petals, soft feathers and juicy, glinting pomegranate seeds, the colours popping from darkened backgrounds. Another thing about Marie that has become apparent over the twenty years I have known her work is how ridiculously well connected she was. She knew Fanny Cornforth, which came as a surprise, but then both were friends of Samuel Bancroft Jnr (whose collection is in the Delaware Art Museum). 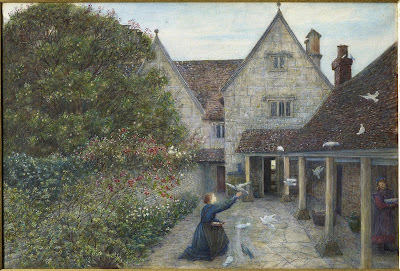 Her watercolours of Kelmscott Manor are the result of visits to her friend Jane Morris. 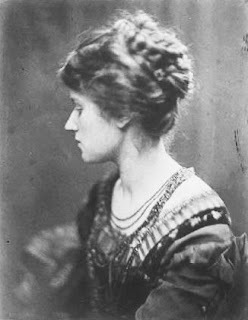 Pupil of Ford Madox Brown and model for Julia Margaret Cameron, Marie switched between muse and artist, again a link to Elizabeth Siddal. In a society that valued her primarily for her beauty (both Rossetti and Swinburne, among others, were very vocal on the subject), it is to her credit that she worked so hard to be taken seriously as an artist, if that isn't an odd thing to say. This exhibition is a testament to a woman who painted poetry and brought the soft romance of the world of the imagination to life. If you are able, go to the Watts and fall in love with her yourself. 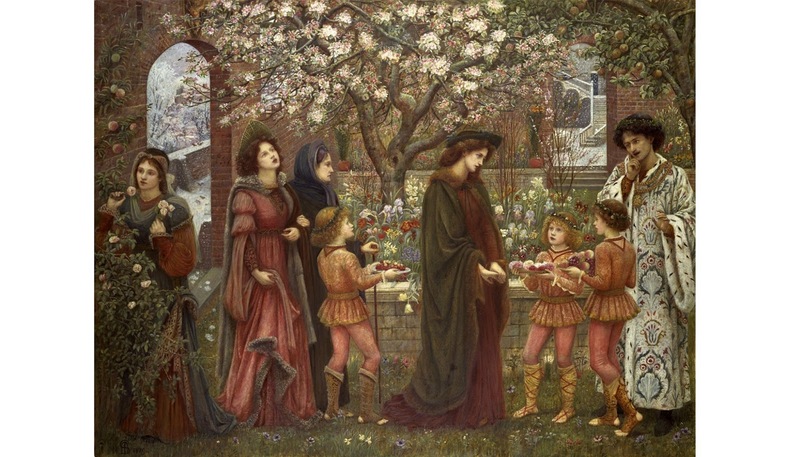 Poetry in Beauty: The Pre-Raphaelite Art of Marie Spartali Stillman is on at the Watts Gallery until 5th June and further information is available here. There is a splendid catalogue available which contains all the pictures and objects that were in the exhibition at Delaware, and is well worth the investment. I went to see the exhibition a few weeks ago. 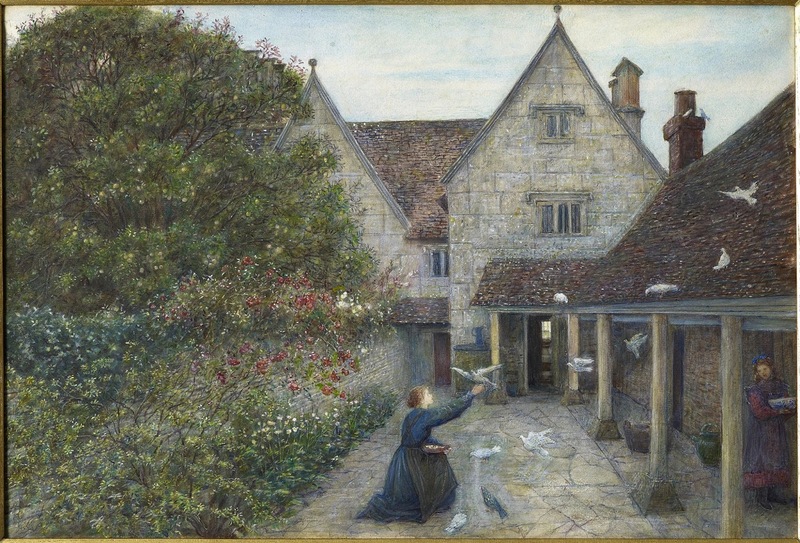 Stillman has long been one of my favourites - personally I think she was as technically gifted as the best of the nineteenth century, and it is a pity she isn't more well known. 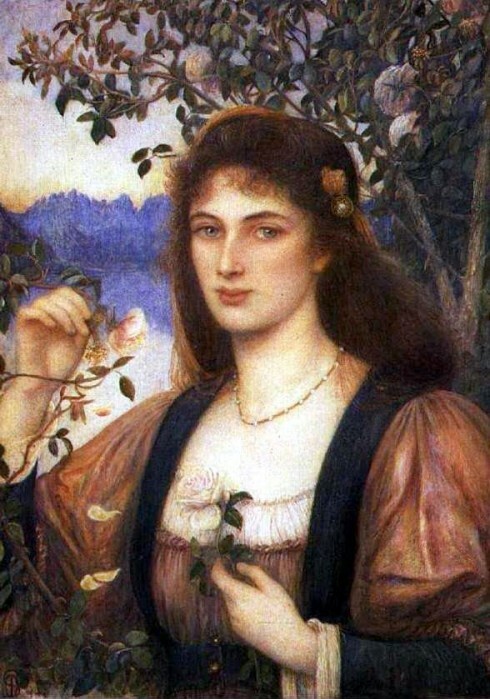 I expect people think of her as "Rossetti-lite" and it could be argued that she is a bit "pastichiste" (if there is such a word?). It was our visit to the Watt Gallery - great to see all the wonderful paintings (especially "Hope") and also to see the great cast for the Tennyson statue. It's such a marvellous gallery (and very tempting bookshop), not to mention the chapel, which is extraordinary. We love saying hello to Big Friendly Tennyson as well.